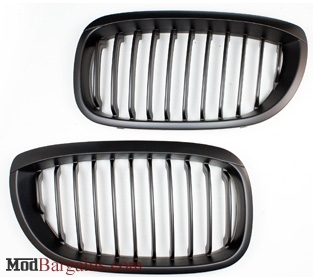 Upgrade the appearance of your vehicle by simply replacing your stock chrome grilles with Matte Black Grilles. 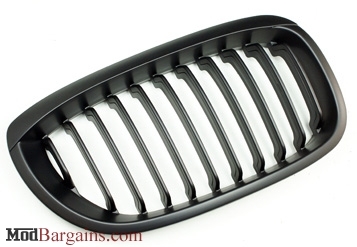 Our Matte Black Kidney Grilles for the E46 are the perfect addition to your BMW, no matter the color or modification style you are going for. 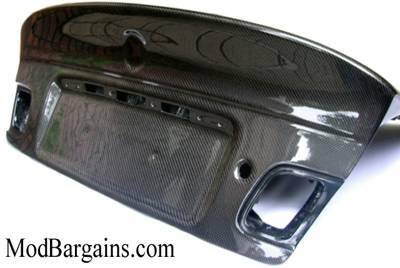 Our grilles especially compliment your vehicle if you have black window trim, tinted windows or tail lights, or ANY other carbon fiber accents on your vehicle. These grills will give your car a sleek, yet aggressive addition and are a must if your goal is to "black-out" your car. They also add a beautiful contrast to your car's paint color and are a huge improvement over the stock chrome grills. 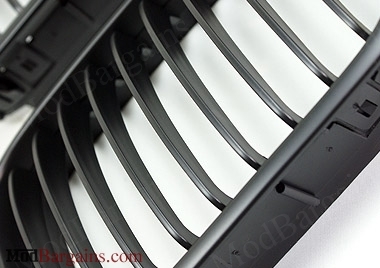 The Matte Black Kidney Grilles can be installed in under 20 minutes, and no extra tools are required. We do recommend to install the grilles on a warm day to minimize the risk of breaking the clips used to hold the grilles in place. Average Customer Review: 5 Based on 10 Reviews. These grills were the first thing I got when I bought my M3, Matte Black looks a lot better than the OEM chrome. These are a high quality two piece grill and the install is insanely easy as you just have to pop them into the hood. Perfect fitment and I have had no issues. Fits my 02 325Ci Vert perfectly. Shipping was fast. This install should only take 5 min tops, but I didn't know what I was doing and it took forever. I was trying to separate the pieces and install them by clipping them together. That was incorrect. The clips are their for removing your grille. When installing the new grille, you should keep the parts clipped together and insert the whole assembly from the front of the hood. You have to push hard, but they pop right into place. the grilles were great. the fitment was perfect and easy to install. I would definetly suggest these to anyone looking to give their BMW a more aggressive look. I bought some cheaper grilles before I purchased these and I got what I paid for. They didn't fit right and were a waste of money. I ordered these and installed both in under 2 minutes. They look great, haven't chipped or flaked were the easiest mod I've ever installed. Great fit & finish. Highly recommend. Fits perfectly. Will recommend to anyone and will shop here again. Nice stuff to fit in the car, gives a classic look. Thanks to Modbargains. The ordered grills fit perfectly!!! Great product, nice quality and they snap in and fit perfect. Seem like better quality than the OEM grilles. Great deal! !